I started out with the intention of doing a recent purchases post. when I realized how much of my recent purchases was actually active wear, I decided it needed its own little feature, especially since so many people are starting to get back on the treadmill now that the holidays have come and gone. I actually made my initial active wear purchases back right after Thanksgiving. James and I had just started using a gym and as visual motivation and as a replacement for some old work out clothes that had seen better days, I purchased 3 of Gap’s long-sleeved breathe tees. after testing them out over a week of workouts, I went back for a few more in different colors. since I received a hefty gift card to Gap Inc. for Christmas, I then went back after the big day and picked up a few more pieces, including some tops in other styles and some bottoms. the breathe tees are amazingly soft and lightweight and really do let your body “breathe” during workout. I like the fact that they’re longer on the body and that they don’t cling but rather just skim close to the skin. 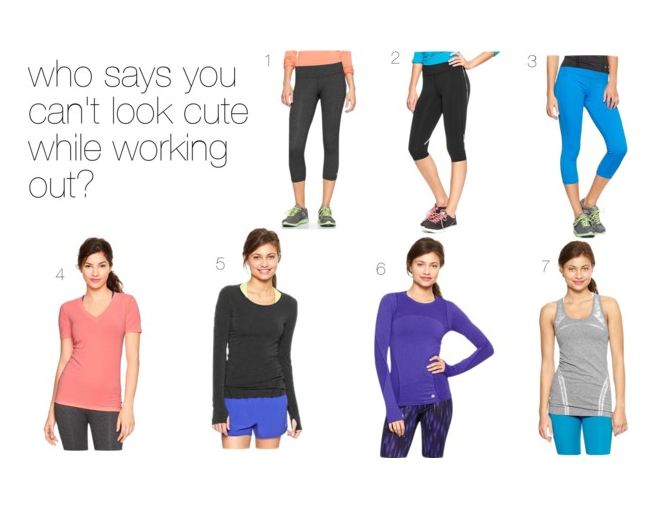 these have become my favorite shirts to wear – they’re just so comfy and cozy to work out in. I also love that they come with thumb-holes so that my hands stay warm. The short-sleeved version is just as soft, and I think it’ll be great come summer for warmer temperatures. I think these run true-to-size to ever so slightly large – it’s a forgiving fabric. I wanted something a little slouchy to up the coziness factor, so I sized up, but I could have gone with my regular size, no problem. the other shirt style I picked up was the long-sleeved motion tee. this one is made of a thicker, scuba-like fabric than the breathe range. I like them for more cardio-centric workouts, since I think the fabric has better moisture-wicking abilities. while the breathe tees feel like you’re wearing nothing, the motion tees feel like you’re keeping all of the sweat in, if that makes sense. these come with thumb-holes as well. I also picked up some of the racer-back tank versions. these I think run true-to-size to slightly on the smaller side. I sized up just because I like to wear things looser anyway. as for bottoms, I’ve been a big fan of the gfast gapfit pants for awhile. they have just the right amount of stretch to be comfortable but not sagging or loose in any way. I get my leggings in the capri version, which on my 4’11” frame is more ankle length. I picked up some heathered cotton-blend pairs, as well as your traditional lycra pairs. I also picked up some sprint capri leggings for days I’m logging in some miles on the treadmill or outside. I find that these sit closer to the body, lighter, and a little more aerodynamic than their gfast counterparts. I think gap’s gapfit range is pretty awesome. I like that they have different options when it comes to materials, lengths, and styles, not to mention colors. I love black leggings and darker workout gear, but sometimes, you gotta have a bright shirt to run in. they also have other pant styles and fits that are aimed at certain activities, like dancing or yoga. I also find the quality to be good and the price point to be fair, especially when there’s a sale. sales happen often at Gap, I find, so I always wait for one and scoop them up for 30-40% off. if you’re in need of new workout clothes, I’d recommend that you give these a try.